This week Celluloid Cinema is stepping back in time to the year 1967 in order to discuss why The Graduate is the perfect coming of age film. In order to successfully contribute to the coming of age genre, the film took a lot of the common situations we work with within the genre and presented them with a unique twist by using the element of symbolism. Instead of focusing on a child going into adulthood, it shows us a successful young man who is lost in the world, despite seemingly having his life together. The use of uncommon examples does not stop there. The film also centers on the life of a middle-aged woman to show that being “grown up” does not equate to being mature and understanding the world. With the support of sound design and visual editing, the characters in the film are able to stress the theme of transitioning to adulthood. The exploration of these examples will show why The Graduate adds something new to the coming of age genre. The protagonist, Benjamin Braddock, is first seen getting off the plane coming home from college. He is well put together, and embodies the definition of a young man who knows his purpose in life. The director, Mike Nichols, decides to maintain a close up on Benjamin for the opening title sequence allowing the viewer to examine him more than they normally would if the shot was shorter in length. When this is done, the audience understands that Benjamin does not appear to be pleased at all, and is simply going through the motions in life. In addition, the idea of Benjamin passively going through life is symbolized by the moving sidewalk in the airport. Instead of breaking the norm and going a different path or speed Benjamin steps onto the sidewalk and allows it to control his movement. As the film progresses, the story continues to show that Benjamin does not create his own path in life because he is not quite sure what to do, even though his family and friends all consider him to be an adult. 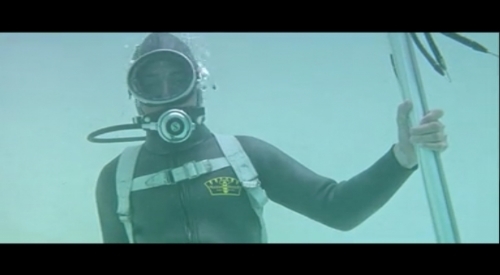 Nichols makes this point apparent to the audience in the scene when Benjamin puts on scuba gear, and the only sound the audience hears is emptiness interrupted by monotonous breathing. This symbol represents how Benjamin does not possess any internal thoughts, and is only concerned with continuing on. As the audience experiences Benjamin’s journey to understanding adulthood, they are presented with another character, Mrs. Robinson, who is not as mature as many would assume. When the audience sees Mrs. Robinson early on in the film, she looks well put together and larger than life, as most adults do in the eyes of a child. This idea takes physical form in the image that is used for the promotional posters for the film, where Mrs. Robinson’s leg, covered by a nylon stocking, takes up most of the frame (appearing larger than life), while Benjamin is placed smaller in the background. 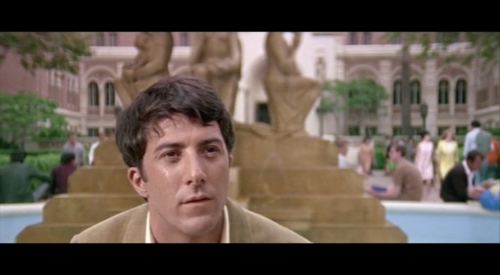 This idea of Mrs. Robinson understanding adulthood flips within the film when Benjamin reveals to Elaine, his girlfriend and Mrs. Robinson's daughter, that he is having an affair with her mother. When this occurs Mrs Robinson is framed differently than she was up until this point in the film. Instead of dominating the frame and looking well put together she appears small and disheveled. This changes the audience's perception of her by making them question if she was really as se cure with herself as she acted. Both Benjamin and Mrs. Robinson display the theme of discovering what it really means to transition to adulthood. Yet, each character comments on this in a different way. Benjamin does not really know his place in the world, although most would assume by his awards and accolades that he does. This is because he restricts himself and limits his options, due to a fear of negative consequences. In contrast, Mrs. Robinson has zero accomplishments, and lives an unfulfilling life as a housewife. Unlike Benjamin, she does not limit eliminate any of her choices and lives carefree. This results in her living Benjamin’s worst nightmare, by having to deal with negative consequences, including losing her once lavish lifestyle. Ironically, although she lives her life in ways completely opposite of Benjamin’s, her actions ultimately leave her lost in the world in the same vain as Benjamin, after Mr. Robinson and Elaine disown her. During the latter part of the film, Benjamin attempts to live the same selfish carefree lifestyle as Mrs. Robinson when he convinces Elaine to run away with him in the middle of her wedding. As the two run away from the wedding, the audience and characters are caught up in the moment and believe that Benjamin has finally figured it all out, since he has happily rescued his “dream girl” by taking charge in his own life. Nevertheless, as the two find their seat on a bus out of town, the camera lingers on the characters longer than normal, allowing the audience to fully examine the characters (much like the opening). At this point, Benjamin, followed by Elaine, realizes just how deeply they have ruined their lives in the last few moments, and how lost they are now because of it. By the end of the film, the story has demonstrated multiple times to the audience that each path you choose in life will lead you to a place where you struggle to find where you belong. This suggests that “coming of age” is something that humans never truly grasp in their lives, because by the time we reach our goals, we realize that is not what we really wanted anyway. In conclusion, the film The Graduate possesses incredibly dynamic characters that practice different methods to discover where they belong. The director, Mike Nichols, is able to express these characters emotions and moods through an exceptional style of visual composition and sound editing that changed the course of film. These elements, mixed with extraordinarily dynamic characters, not only results in the pinnacle of coming of age films, but also provides a clear cut example of how a film should be used to explore theme. Thank you for visiting Celluloid Cinema. Please answer in the poll below whether or not you think The Graduate is the perfect coming of age film. Is The Graduate the perfect coming of age film?